Many of us start our journey in woodworking producing designs with dead straight lines and easy to produce 90° joints. 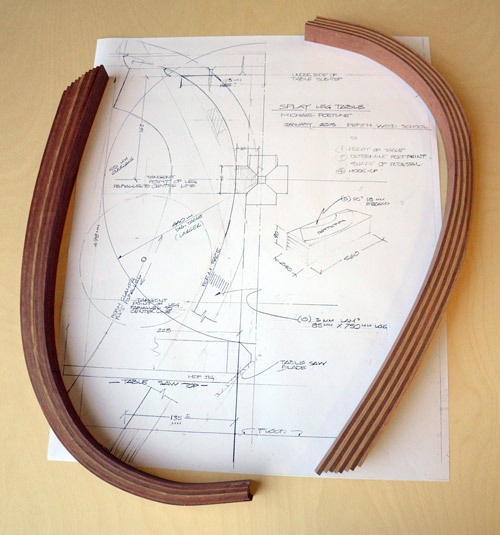 Once a woodworker starts to experiment with curves, they find out how much more interesting a design can become with the addition of curved components. However including curves in your design may not be quite as simple as cutting out a shape from a straight board. Important factors to consider are the appearance of wood grain in relation to the curves, ease of production and the structural integrity of the curved piece. 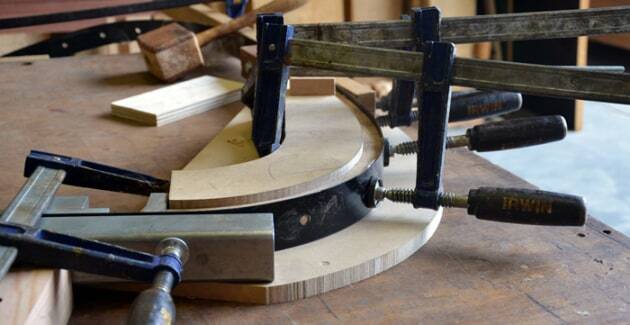 Heading for the bandsaw is certainly one of the fastest, more straightforward methods of making curves. If quick and easy is what you’re after then this is the method for you. Cleaning up the roughsawn edges with rasps, spokeshaves, scrapers or even template following router bits gets the job done witha minimum of fuss. A major advantage of sawing curved components is your ability to produce very accurate curves that are faithful to your planned dimensions and desired shape. However simply sawing a curved component from a straight wide board is not only wasteful, it also means the grain does not follow the visual flow of the curve. Don’t underestimate how bad this looks. Even worse, with tighter curves running across the grain you may very well end up with a component that has particularly weak short grain running through it, destined to fail in service. Bandsawing curves may be best suited to gentle curves and where the structural integrity of the piece won’t be compromised by sections of short grain. Look for boards that have a naturally occurring curved grain as close to what you are after as possible. Make a template of the curved section you’re after and take the time to lay it across any boards you have found with curved grain. You’re in luck if you can saw out a curve where the grain just happens to match! Often a natural progression from bandsawn curves is laminating multiple strips of wood together around a jig or former. Laminating timber to produce curves requires considerably more preparation than sawn curves but the results are well worth it. Laminated curves require some planning and prep work to produce a jig or former that will assist in creating the shape you desire. In our workshop we utilise a vacuum bag system to press layers against a jig but in most home workshops lots of strong clamps will usually do the job. You will also need to experiment to find out the appropriate thickness of strips in the species of timber you intend to use, for the particular curve that you wish to make. It is worth noting that some timbers bend much more easily than others. Laminated curves overcome the problem of the grain not following the curve. This method often produces extremely strong components making it a good one to employ where structural integrity is important such as rockers on a rocking chair. Depending on the timber species, surface area and radius of your curve, PVA may not be at all suitable. When laminating curves we almost always opt for an epoxy adhesive. Apart from the many clamps required, more expensive glues and preparation of jigs or formers, you do need to be aware of one significant characteristic of laminated curves. ‘Spring-back’ often occurs after the glue has set and once you take off all the clamps. In laminating a curve, you have taken a bunch of strips and forced them around a curve. Once the glue has set, it locks all the timber together but the tension still remains. How much spring-back you encounter is dependent on several factors such as the timber species used, thickness of the strips, how tight your curve is, type of glue used and the total thickness of your lamination. Spring-back doesn’t just affect the results achieved straight off the jig. The tension that always exists in a laminated piece can also cause unexpected results once you start to alter the shape in any way. 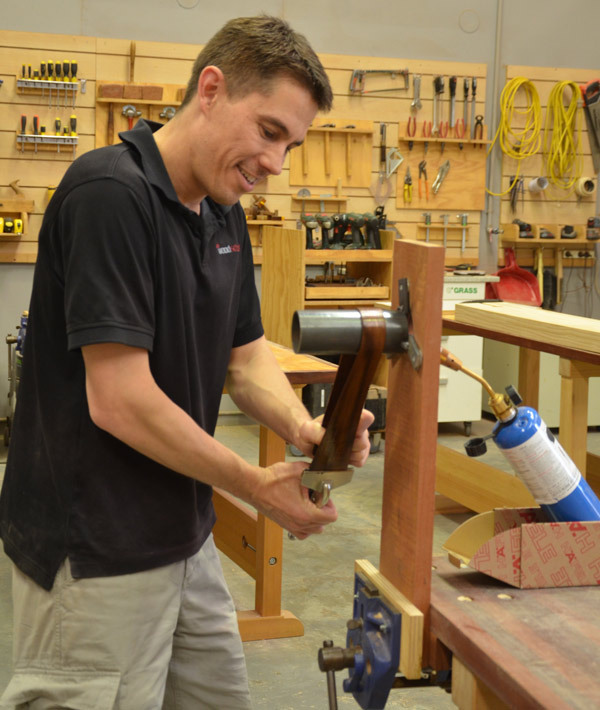 Removing material from the outside with a rasp or spokeshave, drilling into the sides for dowels or dominos, or chopping mortises can see your piece start to change shape. 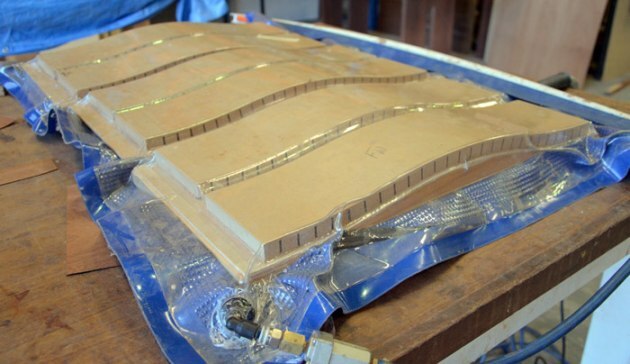 Experimentation is a key ingredient for success when it comes to laminated curves. As a much younger woodworker I still remember watching early Triton workcentre demonstrations that involved making multiple saw cuts close together across thick lengths of timber to produce flexible pieces. Oh the possibilities! Kerf-cut bending combines the process of structurally weakening a length of timber by cutting deep, closely spaced kerfs usually across the grain, then laminating the flexible piece with outer layers to produce a rigid curve. This method of producing curves is good fun. While it still requires just as much planning and preparation as the laminating process, the kerfed section can be easily produced on a small tablesaw or with a sliding mitre saw. You will need to apply timber to the edges of kerf-bent pieces to hide the kerfed section. You can use different materials such as a cheaper, lighter timber species for the kerfed piece, and then use your preferred timber to laminate to the outside. Using steam to heat timber, allowing you to bend it into curved shapes is a most extraordinary technique and a really great fun exercise. Two guys that are arguably some of the most experienced practitioners in the world with this method are David Haig from New Zealand and Michael Fortune of Canada. We’ve been lucky enough to have both David and Michael share their wealth of experience with us over multiple visits to our workshop. At around 99°C a strange thing happens to timber. By heating timber to this temperature, lignin, the substance largely responsible for making timber as rigid as it is, loses some of its bond strength. This allows wood to be bent into some amazingly tight curves. Using steam to heat timber is perfect, as it takes it to exactly the right temperature while preventing the timber from drying out at all. After reaching 99–100° and immediately upon removing timber from a steam box, the timber is flexible enough to pull around curved jigs with the aid of specially designed compression strap clamps. Michael Fortune designed almost all of the steam bending equipment sold by Lee Valley in Canada. Much like there are suitable timbers for laminating, and those that aren’t, there are species that are suitable for steam bending, and those that really just fail. Air dried timber is almost essential. While some kiln dried timber in thinner sections will bend, the high failure rate makes it hardly worth attempting. 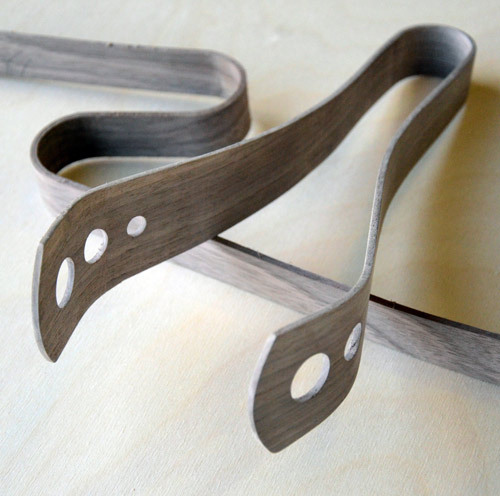 Walnut, oak and beech are all great for steam bending. There are some major advantages of steambent components over parts produced by the other methods noted here. The grain follows whatever curve you produce, allowing for much easier shaping with a spokeshave. You have not diminished the structural integrity of the timber either. After proper cooling and drying, a piece of steambent wood has no memory of ever having been straight so spring-back isn’t really a problem, although it can occur if the initial bend fails to be clamped and dried correctly. Continuing to curve tighter can be just as much a problem as straightening out if you don’t allow the piece to dry sufficiently before removing it from its form. The steam bending technique requires a very considerable investment in equipment. In my experience with setting up for steam bending, you would really want to be producing quite a few curved pieces or your project would want to rather high-end for it to be worthwhile going to the trouble. If you are bending rather thin pieces of timber, another fun way to create tight curves is by setting up a hot pipe and pulling your timber around it. This technique is low cost, easy to set up and opens up some interesting possibilities and projects. As the name suggests, a small length of metal pipe, heated with a gentle flame provides the heat source to break the lignin bond as described for steam bending. I’ve also seen people rig up an old saucepan and propane torch. Around 150mm of reasonably thick walled steel pipe of between 35 and 60mm diameter is ideal. Two or three metal tabs welded onto one end allow you to fasten the pipe to a hardwood backing board. A cheap propane torch available at most hardware stores is a good heat source. Once hot, you only need a tiny flame to maintain the correct temperature. When droplets of water dripped onto the pipe dance around briefly before sizzling off, you’ve got it about right. Too hot and the droplets sizzle off immediately. With the absence of steam to prevent your timber rapidly drying out and resembling burnt toast, you need to soak your pieces in water for a couple of days. Walnut dressed down to 4–5mm works brilliantly with this method. I haven’t had so much success with beech, however the beech I have is definitely kiln dried. Some duck bill sheet metal locking pliers are perfect to hold the ends of your timber and aid your ability to pull it down and around the hot pipe. 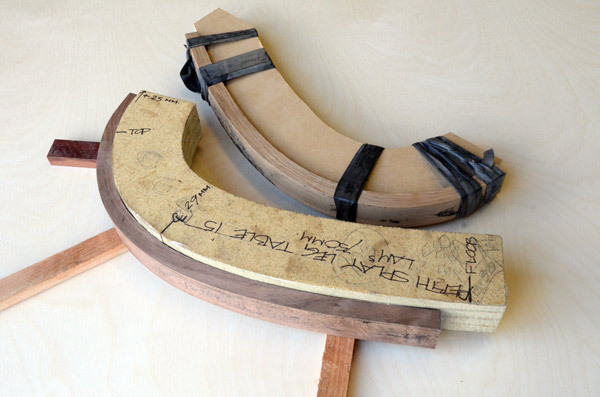 After creating your curved components with one of the methods described here, you may like to shape the timber to create some smooth, graceful lines. Rasps, files and abrasives are all very handy for this task but my favourite method of working curves is definitely the spokeshave. When I was very young, my great grandmother told me stories of her father taking her along to the wheelwright to replace the steel tyre on his cart wheel. She would describe watching one of the wheelwrights shaping spokes with a spokeshave. Of course at the time I had no idea what a spokeshave was. Shaping curved pieces of timber with one of my spokeshaves is the very most enjoyable activity that I can do in this amazing world of woodworking. 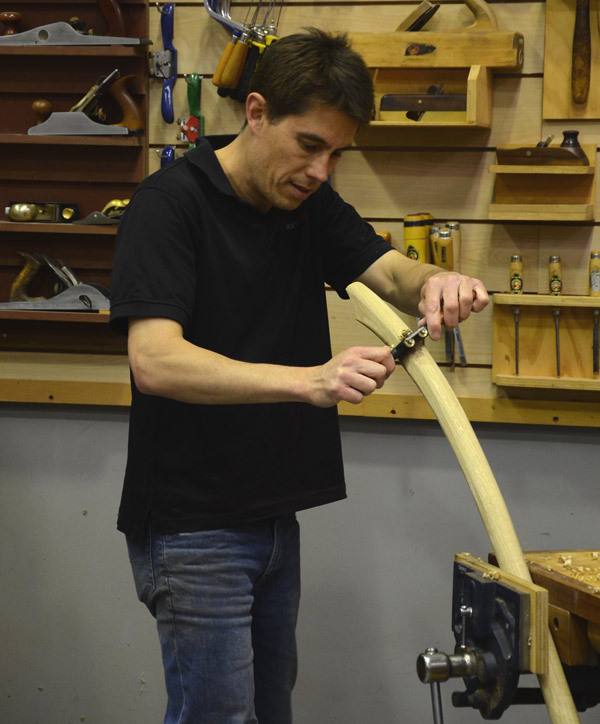 David Howlett graduated from Curtin University as a Design and Technology teacher and taught woodwork and furniture making at public and private schools for 13 years before establishing the Perth Wood School in Welshpool, WA.